Start your Maldives holiday package with the arrival at the airport where one of our representatives will receive you and help you to get transported to your pre-booked resort with the help of speed boat. The evening is free to enjoy beautiful surroundings of this beautiful country. Enjoy dinner and overnight stay at the pre-booked hotel. Enjoy morning breakfast and then proceed for the sightseeing tour of Maldives where crisp blue water and secluded beaches surely make your day. Start your journey with a visit to a historical place the Utheemu Ganduvaru, the residence of Sultan Mohamed Thankurufan who is considered as one of the heroes of the country, then visit the Hukuru Miskiiy which is also known as the Old Friday Mosque is one of the oldest mosques of the island, then proceed towards National Museum which houses different kinds of historical artifacts that reflects the history of the country. After some rest proceed towards Alimatha Island which is located in the Vaavu Atoll is a complete Maldivian destination for tourists offer world class facilities for water sports. Return back to to hotel for dinner and overnight stay. Today after breakfast explore the beautiful beaches of the country and indulge in various adventurous activities and water sports etc. Visit the Biyadhoo Island Resort which is one of the calm beaches of the Maldives is a peaceful resort and is one of the best reef houses in the country and PADI Dive center. Visit the HP Reef which is one of the best diving sites where you can explore the variety of superb coral reef formations and then proceed towards the Banana Reef which is renowned for its amazing marine life. After enjoying the whole day in the most scenic surroundings return back to the hotel for dinner and overnight stay. On the 4th day of your Maldives honeymoon package continue your journey towards other beautiful beaches and visit the Manta Point, a diving area where you can enjoy seeing large numbers of manta rays and enjoy the unique and exciting diving experience, then proceed towards Sun Island resort and spa which is renowned for its exotic tropical flowers, beautiful greenery and stunning lagoons. It is among the most luxurious resorts in the country decked with luxurious amenities. Return back to the hotel for dinner and overnight stay. On the last day of your Maldive Tour after breakfast, pack your bags and drive towards the airport for the return journey with a bag full of wonderful memories of this tropical beauty. 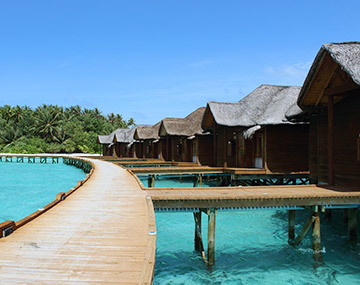 The Maldives evoke the images of a tropical paradise which is covered with pristinely beautiful beaches, an archipelago of 1,192 coral islands, 200 inhabited islands and some of the most beautiful tourist resorts which all lie in the southwest of India considered as the part of Southern Asia. It is one of the hottest tourist destinations for those who love sun, sand and seafood and is no less than a geographical marvel. So book your Maldives tour package and enjoy one of the best holidays of your life. From private tours to small group itineraries, from family vacations to business trips BookOtrip offers you seamless travel experience no matter in which part of the world you want to travel. Explore the world, customize your tour package, grab the lowest rates and enjoy the guaranteed service. Very well organised package to an awesome place. All the sightseeing, food, stay, transfers etc.. were good. Enjoyed a lot. Thanks a lot Bookotrip.